Date of Release: April 2, 2013, Jennifer E. Smith Inc. The story is about two young teenagers whose affections broke the line between the worlds of fame and being kept. Graham Larkin is a superstar, in the other side he is just like any other ordinary adolescents. He fell in love and experienced things beyond the silver screen for an ordinary girl he met in the cyber world. Ellie has this red hair and passion for poetry whose mother is persevering just for her to Harvard. The mother and daughter have dark secret which made them run away years ago to prevent her father, a politician from ruining his career. Yes, they were the illegitimate family until her mom decided to take her away and go far away from his father. What would it be like when these two worlds: One, succumbed into the people’s attention and the other one, must hide from the world? In a very modern but almost unimaginable way, they met online, become friends and developed intimate feelings which would encourage Graham to choose Maine, the state where Ellie lives (and his family too at the moment) to be their place of setting for their movie shoot. When they met, there were unexpected commotions of emotions, confusions and realizations. The characters were very modern. These times one of the uses of the internet is to connect with people, including strangers no matter where we are in the world. Fate made these two young people to accidentally meet through e-mail, the rest of the story follows. Is it possible for two young people to truly to fall in love in the world of worldwide web? They resemble teenagers though in different world, have something within their hearts, things they want but they do not know, deep ones that could make them happy. In the story, Graham was this young boy, famous, rich and admired by many as an actor, in the novel, it is said that he loves his career and would rather continue than pursuing his education as advised by his parents while Ellie, an ordinary girl, not rich and is a “nobody” compared to him is a young lady who dreams of meeting her father someday. To see your father on television and you cannot go see and get near him because he is unreachable and is prohibited by fate and even doesn’t even know you are kind of sad and lonely things. Trying hard to survive a fatherless life with a goal to enter college and save and there comes this Mr. Idol who at the end saved the day and her future. The story has a lot of commonplace elements. I would say that it has this usual storyline where Mr. Great falls for Ms. Nobody then they have to endure everything. This suits young readers who are dreamy and hopeless romantics who fancy knights in shining armours ready to save damsels in distress. For the cyber friendship, the author infuses norms of modern present society that is so much into modern technology and the way we could make the world small by e-mails, chatrooms and social networks. The fantasy of meeting someone great online and finding true love, in this scenario, it happened to two different people who became friends and shares their thoughts in their everyday lives. On the deeper side, Ellie’s mother disagreed to continue her blossoming connections with Graham the fact that she was afraid the Press (the world) would discover who they were and avoid what consequence it could inflict to them and her father. There is a very short time frame if Graham finding out the secret, then why did the senator try to do so? Did he happen to have an effort to find them or just secretly support her daughter even though her mother hides her from him? For sure he has these connections and power. The climax that I expected is that the senator and his long lost daughter would have the chance to talk and acknowledge each other than what happened in the book that she just shook hands with him as a stranger. That moment was her chance, her first and maybe the last to tell him who she really was. The ending I would say is realistic though in a sense that Graham was still Graham and Ellie, due to his love for her was financed to go to Harvard to study. The author did not close the story if they ended up as lovers together or not; the ending just showed that it was not the end because they will still e-mail each other. What does happy looks like? 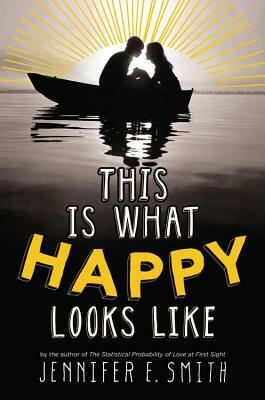 As the title asks the readers, it is about contentment and feeling complete for whatever life brought or might bring for us. oh my I want to read this book! Gonna put it on my booklist :) The story is great! Intersting plot. I should read this too. Interesting plot. I should get a copy of this book. This book is in my "to read" list. I've read Jennifer E. Smith's The Geography of You and Me and I loved it! Sounds like something that will work as a movie too. Have you heard of any plans? This is very interesting. I'll gonna read this soon.